Flock is a simple Internet browser built on the codebase of Mozilla Firefox that offers full support for all the popular social services, such as Facebook, Twitter, YouTube, Flickr, Blogger and many others. Flock provides the option to store all account info for any of the 15 supported social services and is capable of notifying you when your friends perform actions on any social service that you chose to integrate into Flock. This friendly browser provides some additional features for easy online socializing such as drag and drop media sharing, easy photo uploading and a built-in blog editor. 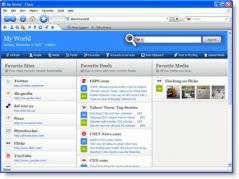 A new and easy to use web browser.